Racing Against Time...: Key Ring---NonFiction Suspense. …oh ho!!!! 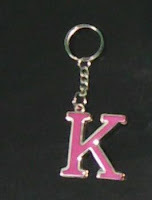 it’s the letter “k”, there are 26 alphabets in English and you have bought this letter, so who is the girl, tell me. She was repeatedly asking the question but I was silent, just made a fake smile. …tell me who is the girl, where she lives? Is she from this town or from other place, what does she do? I was taking tea silently. …look from half an hour I was trying to sort out who the girl is? And if you think you will avoid my question then it will be harmful for you, I am gonna hit you. Ok ok, am sorry; pls tell me who the girl is. What I have noticed about human psychology is…when someone starts to use her/his brain too much then common sense becomes vanished. …First of all you must remember that the initial of our Mom is “K” that’s why I have bought it. …I guessed it but it was hard to believe coz you have deep believe in the foolish act named “love”, so I thought “K” is the initial of someone special to you. …actually I liked the colors of the key rings, the shop owner brought key rings with all the English alphabets but 24 alphabets are already sold, only two were remained, the letter “K” and an another letter and I know you can guess what the another letter is. Telling this I left the dining as soon as possible.